I have an unusual question to ask you: What can you learn from a dog? I am not referring to the ones you find in kids stories or cartoons. The dog I’m going to tell you about was mentioned within the context of keeping good company and the favourable effect that has on a person either through influence on their character or externally on their situation. One finds in a hadith about the difference between the carrier of musk and the iron-smith where we are taught about Allah (glorified and exalted be He)’s Mercy and Forgiveness for those who sat with a group remembering Allah (glorified and exalted be He) even though they were just passing by. Do you think you can figure out who this dog is? If you are still puzzled about why I’m writing about a dog (!) keep reading and you’ll soon find out. In this verse, the dog just happened to follow that group of young believers in their attempt to escape from the non-believing people and protect their faith. Allah (glorified and exalted be He) had decreed that they, with their dog, become an example of Allah (glorified and exalted be He)’s ability to resurrect the dead and so they went into the cave and the rest is history. And thus a dog gained a mention among a righteous group of people in the Quran till the Day of Judgement. SubhanAllah, how many times have I read Surah Al-Khaf and I came to learn about this example just two weeks ago in a course. How many lessons of guidance are we missing by not learning, living or loving the Quran as Muslims should? Did you notice how the revelation of the Quran in Arabic is mentioned alongside understanding and knowledge? The lesson we can learn here is that Arabic is not a barrier, it’s a tool to a clear and concise understanding of the Book of Allah. Once we consciously accept that, inshaAllah we would have made a brilliant start. Learning any language takes time and effort, learning Arabic with the intention of reciting the Quran is a way that allows you to engage with the verses and ponder upon the meaning on a higher level. This Ramadan will pass by quickly, yet how about having a long and short term plan? The long term plan is to learn Arabic in an effective and consistent way. The short term plan should include reading the Quran in a language you understand. 1. Use a good quality translation of the meaning of the Quran. Modern time English Quran translations include: The Qur’an (Oxford World’s Classics) by M.A.S. Abdel Haleem and The Noble Qur’an: A New Rendering of Its Meaning in English by Aisha Abdurrahman Bewley and Abdalhaqq Bewley. Though we all know the Quran is the Holy Book, our attitude towards the Quran reflects how a ritualistic and cultural approach in understanding the Quran has made us defy the purpose of the Book in our lives today. It appears that by placing the Quran on the highest shelves and in the most elaborate of covers we manage to make it unreachable, physically and mentally. It almost needs a ceremony to be brought ‘down to our humble level’ and off the dusty shelves when we are seeking Allah (glorified and exalted be He)’s Help, or even sadly kept for when someone is ill or dying. 3. 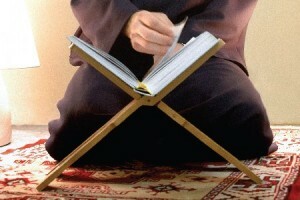 Another tip to live by the Quran is to ensure you have your own copy of the Quran and keep it close. Is it next to your bed or on your desk? Recite regularly even if it is small portions and increase with time. 5. Take your time and ponder upon the meanings, you might find it useful to keep a notebook to jot down your thoughts and the verses you find enlightening so that you have something to refer back to or learn about more deeply later. Include the verses that you find confusing so you can look them up in a Tafseer or ask a knowledgeable person citing the Surah and Verse(s). Recite the Quran and you find Allah (glorified and exalted be He) telling you about the qualities of the people of Jannah and the people of the Hellfire. We are told about the people before us and what brought them the wrath of Allah (glorified and exalted be He) or that when they stood firm upon His path they were blessed with His mercy. Hanan runs Muslimahetc.com. Through it she hopes to give sisters a positive, practical and future focused view on being excellent in taqwa and character. She is also a Pharmacist, King’s College London graduate; Certified Life coach; Member of the AlKauthar Student Guild Programme. She is also a regular volunteer in the Eritrean community in her spare time and currently undertaking a certificate in teaching Arabic at SOAS, University of London.